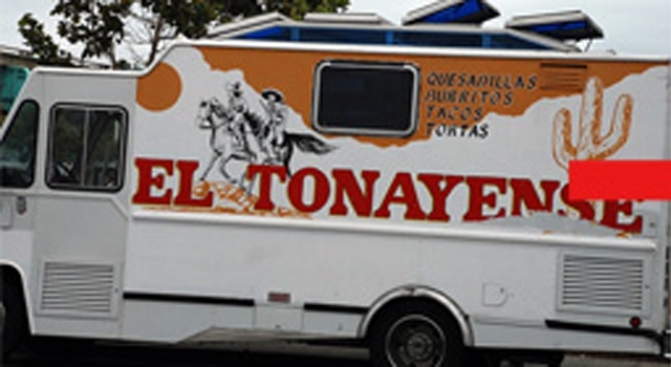 The El Tonayense taco truck is seen here before its makeover. The Mission: Lordy, at least one of the city's iconic El Toneyense taco trucks now appears as if it's been painted by Guy Fieri. The above shot of the 14th and Harrison street food mainstay comes courtesy of a tipster, and well, there's a chance that someone had a bevy of energy drinks before designing the traditional truck's newly intense look. True, the paintjob will increase visibility—maybe even appeal to a new demographic—and the tacos are likely as strong as ever, so good for Tonayense, trying to survive in this economy like everyone else. Now if you'll pardon us as we delicately file this under That's Rather Hideous.